The crafting system allows the player to create new items by using recipes. We’re going to create two Crafting Recipes and allow the player creating them at a special workbench in the game. You can learn more about the crafting system in general in this how-to. First, we’ll set up two crafting types. They’re used to separate our recipes into different types. Open the ORK Framework editor and navigate to Inventory > Crafting Types. Set to: The art of creating potions. Set to: The art of creating equipment. And that’s it for the crafting types. Now, we need to set up our two crafting recipes. The recipes define a list of ingredients that are needed to create a list of outcomes. Ingredients and outcomes can be items, weapons, armors and currency. Navigate to Inventory > Crafting Recipes and change the following settings. 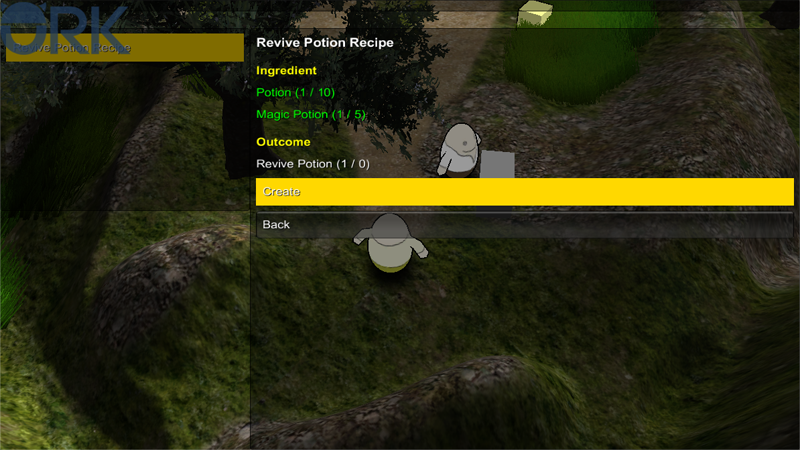 This recipe will use a Potion and a Magic Potion to create a Revive Potion. Set to Revive Potion Recipe. If enabled, the creation of this recipe can be bound to a chance (e.g. by using a formula). The needed items to create the outcome are defined here. There’s already a default item available, so change it’s settings. You can use the chance setting to decide if an ingredient will be consumed in the crafting process. E.g. when setting the chance to 0, the item will not be consumed. Click on Add Ingredient to add another ingredient. The outcome of the recipe is defined here. There’s already a default outcome available, so change it’s settings. And that’s it for this crafting recipe. This recipe will use a Short Sword, a Fire Scroll and three Magic Potions to create a Fire Sword. Set to Fire Sword Recipe. And that’s it for the crafting recipes. Displaying a crafting recipes ingredients and outcomes is managed by Recipe Layouts. The default recipe layout is defined in Inventory > Inventory Settings, so let’s navigate there and take a look at it. The content settings define how the recipe is displayed in general. This will display the name of the recipe (%n) in bold, bigger letters. The header for the ingredients list (%in) and outcomes list (%out) is displayed in big, yellow letters. These settings define how the individual ingredients are displayed when using the ingredients list text code (%in). Each ingredient will be displayed in its own line. Set to #text.color4#%n (% / %a)#<color. The name (%i), needed quantity (%) and available quantity (%a) are displayed in green letters. Not available ingredients will be displayed using a different text. We can use this to highlight missing ingredients. Set to #text.color3#%n (% / %a)#<color. The text will be displayed in red letters. These settings define how the individual outcomes are displayed when using the outcomes list text code (%out). Set to %n (% / %a). And that’s it for the default recipe layout. Crafting recipes are used through a menu screen. Navigate to Menus > Menu Screens and add a new menu screen. Click on Add Menu Part and than on Crafting. This adds a new Crafting menu part to this menu screen. Change the following settings. The crafting type and crafting recipe selection will use the same GUI box. The recipe’s content will be displayed after a recipe has been selected. Selecting if a recipe should be used or not is done using choices. Otherwise the Ok and Cancel button of the GUI box would be used. A back button is added to the choice (after the Create button). And that’s it for the menu screen. Usually, we’d add the new menu screen to our Overview menu, but we don’t want the crafting system to be accessible in the menu – only in special places in the game world. Click on Save Settings to save our changes. Now, we need to change our start event to teach the player the recipes we just created. Navigate to Events and click on Open Game Event. Select the startEvent and add two Add Recipe steps after the last step of the event (the Learn Log Text step). We also need to add the player as an actor in the Event Settings. Click on Add Actor to add an actor and change the following setting. This step is connected to the Next slot of the Learn Log Text step. This step is connected to the Next slot of the Add Recipe step. That’s it for the start event, click on Save Event to save the changes. We want to open the crafting menu when the player interacts with a workbench in the game world. Create a new game event by clicking on New Game Event. Click on Add Choice to add a choice. This step will open a menu screen – the event continues after the menu screen has been closed. Connect this step to choice 0 of the dialogue step. 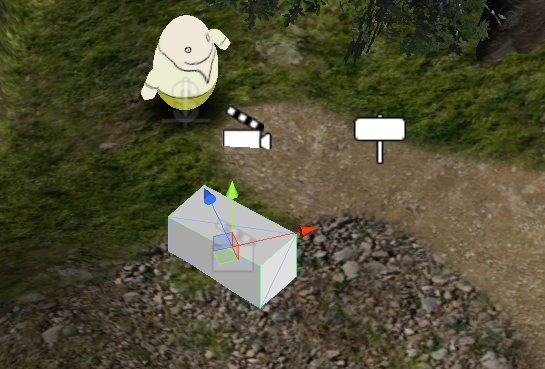 And that’s it for the event – click on Save Event and save it as workbench in Assets/Events/Town/. In the inspector, select the workbench event we just created in the Event Asset field and click on Ok. The default interaction settings are enough for our event (start type Interaction). Open the main menu scene (0 Main Menu) and hit play. Walk to the backyard and interact with the cube. You can now create new items at the workbench. And that’s it for now – the next lesson will cover loot.